Latest Whatsapp Status In Hindi - Being updated is the most important part and it is very necessary to update everything regularly to get the most advantage. So today we posted latest Hindi status for Whatsapp to keep your whatsapp messenger wall updated with our new status messages. People always pretend to blame others that they copied their status from their walls, so why copying when you are getting daily dose for new status messages here. From now stop copying and start getting new status. 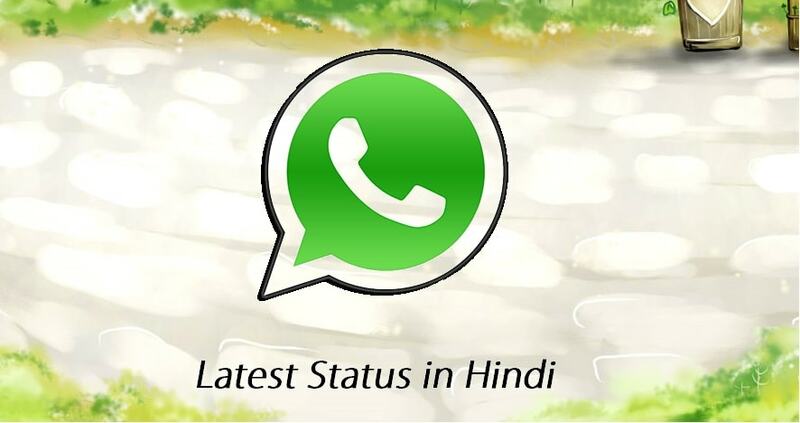 So here are our collection for new status messages in Hindi, pick any of the status you like and stick it on your whatsapp wall and don't forget to share this collection so your friends can also benefit from this. जो कहे मेरे पास वक्त नही, असल में वो व्यस्त नही अस्त-व्यस्त हैं..
हर मर्ज़ का इलाज नहीं दवाख़ाने में,￼ कुछ दर्द😵 चले जाते है सिर्फ़ मुस्कुराने में 😊!! Kisi ke liye jeena padta hai, to kisi ke liye marna padta hai... Dil na chahe bhi to kya kare, Sab ki khushi ke liye Hasna padta hai !! किसी के लिए जीना पड़ता है ,तो किसी के लिए मरना पड़ता है !! दिल ना चाहे भी तो क्या करें , सबकी ख़ुशी के लिए हँसना पड़ता है !! Ab apni Shashiyat ki bhala mein kya Misaal du yaaro, na jaane kitne log mashur ho gaye, mujhe badnaam karte karte.....!! अब अपनी शख्सियत की भला मैं क्या मिसाल दूँ यारों, ना जाने कितने लोग मशहूर हो गये, मुझे बदनाम करते करते…..!! जिन्दगी के सफर से, बस इतना ही सबक सीखा है , सहारा कोई कोई ही देता है, धक्का देने को हर शख्स तैयार बैठा है…!! ये दुनिया अक्सर उन्हें सस्ते में लूट लेती है, खुद की क़ीमत का जिन्हें अंदाजा नहीं होता !! So these were the latest hindi status for Whatsapp messenger, hope you already selected for your whatsapp wall. We will be updating this list regularly and if you have some amazing status you can comment down and for any kind of support comment down, we will get in touch.